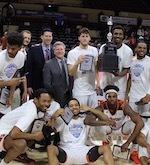 The Master's University men's basketball team didn't need another lesson in how dangerous this University of Saint Katherine club can be. Last week, the Mustangs led the Firebirds by three at halftime before pulling away for a double-digit, if less-than-comfortable, win at TMU. Six days later - during which time Saint Katherine knocked off No. 9 Hope International - the No. 1-ranked Mustangs dispensed most of Friday's drama with a crushing run that spanned the closing of one half and the opening of the other, beating the Firebirds 88-73 on the first day of Vanguard's tournament in Costa Mesa. "We were ready for sure," said coach Kelvin Starr. "We knew they're good enough to beat any (Golden State Athletic Conference) team. No question we had to be ready." The Mustangs (5-1) will play Trinity International from Illinois on Saturday at Vanguard, looking for their sixth straight win. Master's has won 29 of its last 31 non-conference games during the regular season dating back to 2016-17. 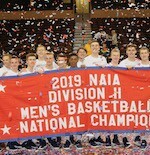 This one was secured with a 32-8 run that spanned the final eight minutes of the first half and the first three minutes of the second. Darryl McDowell-White set the table. With two minutes till intermission, the junior guard took a handoff outside the three-point line and curled toward the basket, dropping the ball off to Tim Soares in the paint. Soares rose and dunked through contact. And after the free throw, the Mustangs led 41-33. Moments later, McDowell-White committed thievery, sprinted the length of the court and fed Michael Taylor for a slam. Hansel Atencia got in on the fast break fun not long after when he hurtled down court, knifed into the paint and slung the ball behind his back to Brock Gardner, who laid it in for a 12-point lead. Gardner finished with a team-high 16 points and nine rebounds, further proving his coach's week-old comments. Starr said after his team's win over Bethesda on Nov. 13 that one of the game's high points was getting Gardner, a player who averaged better than 12 points and eight rebounds a year ago, on track. The train hasn't slowed since. "He's great at putting the ball on the deck, and he can hit shots from the outside," Soares said of what makes Gardner such a tough cover. "He's very athletic, and he can back guys in - which can make him a nightmare for other teams." Gardner attacked the paint repeatedly Tuesday in a gritty win over Antelope Valley, making 15-of-19 free throws and finishing with a season-high 21 points. The 19 attempts were the most in Mustang history. TMU also set program records for free throws attempted (46) and made (36) in the game. Master's made 24-of-31 free throws Friday and continued to enjoy balanced scoring. Soares scored 15 points as one of five Mustangs in double figures. Seven players scored eight or more points, a stat that mirrored TMU's season box score. Jordan Starr scored 14 points with seven rebounds, Hodges Bailey contributed 13 points and Atencia had 11 points and five assists. The Firebirds, who have played seven games in the last 10 days, didn't go quietly. St. Katherine's Johnathan Ross finished with 19 points and his team pulled within 10 with five minutes to go. But then Starr hit a leaner in the lane, and great ball movement led to a Bailey 3-pointer with the shot clock winding down on TMU's next possession to seal the win. The biggest difference in the game might have been ball security. The Mustangs forced 17 turnovers and parlayed them into 22 points. TMU gave the ball away twice in the first half and seven times in all. "Our guards did a good job of being active," Soares said, "getting after them on defense and converting at the other end." As far as the difference between Friday's matchup with the Firebirds and the teams' previous meeting, Kelvin Starr said the key was TMU's mindset on defense, namely its approach to handling pick-and-rolls. "We hedged on screens more aggressively," he said. "We were more offensive on defense. It set the tone." The coach also said he was pleased with forward Michael Taylor's production, the redshirt sophomore having clearly bought into his role. "Mike is being unselfish, playing great defense and finishing strong," Starr said. Taylor scored TMU's first four points of the second half as part of what became a decisive 10-0 run. Master's led by as many as 24 after intermission. Taylor finished with eight points and eight rebounds in his first start of the season. The effort was a nice complement to Soares, who was coming off arguably his most commanding performance of the season Tuesday at Antelope Valley. The 6-foot-10 center was at it again Friday. "Tim's been able to impose his will on the game more," said Starr.